When you are living overseas with young children you're presented with two options. Stay at home or travel with them. There might be folks out there who are happy to do the latter, and to them I applaud their fortitude. Because while the memories outweigh the inconvenience, schlepping two kiddos and all their baggage across Europe is about as fun as filling a cavity. You go in to hoping all goes according to plan, you ignore the discomfort, and then you walk away numb and head throbbing but better off having done the deed. My kids are at that perfect age where Alex and I are hit with a one-two punch whenever we want to do something fun. Landon has matured enough to endure tours and long stretches of walking, but he has also mastered the art of whining and creating predetermined opinions about sights unseen. If something sounds lame, he doesn't want to do it. Meanwhile, Evie has stepped in the terrible two world like a beauty queen entering center stage. That girl went to sleep one night and visited the dreamworld of ATTITUDE where someone coached her in the art of temper tantrums, then she woke up and decided to stick with her newfound discovery. Little ones have big emotions and aren't equipped to handle the mountain of feelings that wash over them, and those overwhelming moments don't go on holiday simply because you do. This trip to Ireland wasn't our best family vacation, but I don't blame the country for that discrepancy. Nope, the location itself was gorgeous and picture perfect. It was my crazy clan that rolled into town that made it nutty. Alex and I made reservations to stay in Killarney, Ireland (located in the southwest sector of the country) based on the criteria that we wanted someplace away from a city and an area where the kids could run and play. Life had been a little crazy leading up to the trip, and we were hoping to disconnect from reality for a few days and throw ourselves into quality family time. 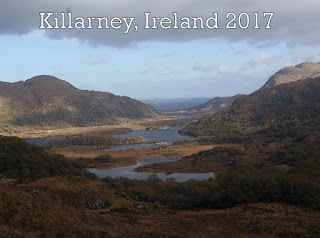 Combine all those requirements with Bucket List of Places to Visit and out came Killarney. We flew out via RyanAir on a Friday and returned the following Monday, meaning we were away for three nights and four days. Alex has had ample experience driving on the left side of the road (which is the setup in Ireland) so we brought the spare car seats and rented a car. A friend recommened checking the seats and storing them in a seat bag, and while I was extremely skeptical about trusting the airlines with my seats, my fears were unfounded. At check in, the airline agent asked us to take our bag to a separate checkpoint reserved for bulky cargo and slapped a fragile sticker on the handle. We then handed it off to a second agent who walked it to the luggage carts herself. After both departure and return, our seats were in impeccable shape, and I won't hesitate to bring seats again. Kudos to RyanAir for their decent baggage handling! Upon arriving at the Kerry Airport, my family walked the half mile to the car rental trailers and waited with approximately a hundred other families to pick up our vehicle. The nice folks at Europcar gave us an orangish-red Ford Focus. Fifty some odd cars sitting in the lot, and they gave us the most ostentatious colored car there. Because the two small children running circles around our suitcase and shouting jibberish to passing strangers wasn't enough to make us stand out. We needed to roll up to places in a rental (or "winter" or as Landon kept saying) that looked like a Fanta soda swirled into Heinz ketchup. Landon got quite the shock when I opened the driver's side door to deposit some of our stuff and he noticed flip flopped seats. "Mom! The steering wheel is on the wrong side! Who did that?!?" For our stay, we booked a house through AirBnB and couldn't have been happier with our decision. The home was part of a complex located less than five minutes outside the town of Killarney and a few kilometers away from the entrance into the National Park. The house provided free parking, three bedrooms, a full living room and kitchen, washer and dryer, and the host left a lot of food for us. The best being cereal and milk for the kids. Our view from the front door. Muffins, fresh bread, and candy left by our host. Despite not getting to go inside the house, my family was able to walk around the grounds and use the toilets that were located on the premises. The area surrounding MuckRoss house was beautiful, with a lake and mountains on the backside and walking trails past the garden areas. My family spent a good half hour exploring the grounds, where at one point Evie fell face first into a large mud puddle. Alex and I turned around for a second and when we looked back, there was our daughter. Partially submerged in brown sludge and completely horrified over her predicament. Since we had gotten our 18 Euros back, Alex and I agreed to splurge and take the kids on a jaunting car ride that was in operation near MuckRoss House. The cost was 40 Euros and horse and driver took us through some of the woods, where we got some more great views of the lake and saw a tree that originally came from California. The car eventually dropped us off near a parking lot that led to the famous Torc Waterfall. We were able to get out, go see the sight, then return to our driver when we were ready to head back. The walk to the waterfall took about five minutes and the entire time we were moving, we could hear the water getting louder and louder. The intensity of the sound built up the expectation, and when we crested a small hill and saw the actual waterfall, it did not disappoint. It was a beastion of power, the water hitting the rocks set into the cliff with a ferocity I did not wish to cross. I could feel the spray of droplets on my face when I ventured close, the foam at the bottom frothy and intimidating. My experience with waterfalls is limited, but looking at Torc I felt very out of place. Everything around us - the trees, the moss, the dirt underneath our feet - felt so old and natural. It was us that were small and temporary, one tiny speck in nature's vast world. Amazingly, that was just the beginning of those emotions for us. After we returned to MuckRoss House via jaunting car, Alex and I grabbed the kids some cold sandwiches from the adjoining cafe and then returned to our car. Evie was in an absolutely foul mood after having to leave the horse and needed a nap. I suggested we drive around a bit and let her fall asleep in her car seat. The trick worked almost immediately and within ten minutes Landon followed suit. Alex continued to drive what was the Ring of Kerry; we had no destination in mind, we simply wanted to take in the country of Ireland for a bit. About fifteen minutes into our tour, we came upon Ladies View. Aptly named after a visit from Queen Victoria and her ladies in 1861, the tourist spot is one I would recommend the most to people visiting the area. Regardless of the cloudy day, the sight when I stepped out of my car was breathtaking. It felt like the rivers running between the mountains went on forever. I was standing at the far corner of the world, looking out on endless lands and possibilities. If the Torc Waterfall was like stepping inside the center of an unknown world, then Ladies View was like standing at its opening. It could have been any year, any generation, there was nothing to pinpoint it to a specific time and place in the universe. Just rocks and water and grass that had been there for centuries and will continue to be there for much longer than my eyes will be alive to see. I've seen some amazing things in my life, but Ladies View is one I feel fortunate having been able to witness. Back in the car, Alex and I continued our drive past Moll's Gap and into the little town of Kenmare. The main street was lined with colorful house and hanging lights, it was a quaint and picturesque village that would have make the perfect honeymoon location. As we were driving out of the town, we even witnessed a rainbow crossing across the sky. For dinner that evening, we went to Main Street in Killarney and chose the Danny Mann Pub. I had the roast of the day accompanied by mashed potatoes and winter vegetables, and Alex had the fish and chips. We both shared a pint of guinness. (The kids had chicken strips and fries...big surprise there.) Everything we ordered was delicious, very fresh and cooked to perfection. We had no regrets with our choice of dining establishment. The rain kept away on our second and final touring day and while it was still chilly, the intermittent sunshine made for a lovely fall day. Alex and I took the kids to Ross Castle first. The castle was closed for tours but guests were allowed to roam the grounds and the interior courtyard. The restrooms were even open for public use. I really enjoyed the sight, despite not knowing much about the castle. There weren't a lot of other people there with us that morning, so the kids were free to run around and explore. It was very relaxing, standing in the open courtyard and looking out on the mountains while the kids danced to and from. While Dublin would have been the more "iconic" destination to visit, I was happy we picked someplace open. Kids are stressful no matter what, but they are less so when the parents aren't constantly keeping them from walking into busy streets or staying vigilant for pick pocketers. Once done at Ross Castle, Alex and I each made a grievous error. Alex decided he wanted to fill up our gas tank before heading towards our lunch destination. I wanted to keep the kids awake until then, so I gave them both their Ipads. Alex, in a hurry, entered the Ring of Kerry and began driving with confidence back to Kenmare, where he had spotted a gas station the previous day. After filling the tank, I told Landon I needed to see his Ipad for a second and took it away. Well, apparently, the combination of swerving left and right at a brisk speed combined with staring at a screen gave Landon a case of car sickness. So there we were. Pulled over on a narrow embankment at the top of a mountain with the wind blowing hard, one of us changing Landon into new clothes while the other cleaned the backseat. For what it was worth, though, Landon was completely fine afterwards and begged us to still go to lunch. We had told him where we were headed that morning, and he was extremely excited about the prospects. The Strawberry Field, this was a small family-owned cottage along the Ring of Kerry serving pancakes of every variety. My son loves all things pancakes, so when he heard there was a restaurant dedicated to the dish, he knew he had to try it. The pancakes were good, but I would recommend sticking with the syrup based items. Much tastier. After lunch, Alex and I took the risk and drove through the Gap of Dunloe. (And fortunately for us, we made it to the other side before Landon felt queasy again.) The road essentially cut through two mountain passes (hence the name, Gap) and it was a narrow one-car-at-a-time dirt path that went up, down, and all around. Traversing the Gap of Dunloe was an experience. The specifics of the route, according to the internet, go as follows: The pass is between MacGillycuddy's Reeks and Purple Mountain. It is about 11 kilometers (7 miles) long and 650 feet top to bottom. There are five lakes within the gap all connected by the River Loe. And it's one formidable path. There were times I looked out my window and saw gaping drops inches away from the wheels. Other times I looked up and saw nothing but the side of a mountain. If I reached my hand out I could have touched rocks and sheep and bricks laid out for bridges. I'm grateful I can say I did the trek, but Alex and I agreed once was enough! The crazy route beat all of us up, the seven miles took us over half an hour to complete because we had to drive so slow and find spots to pull off and let other vehicles pass. After such an adventure, Alex and I called it an early night and were back in our home by 4:00 p.m.
Monday morning we finished off the remaining food in the house, packed our last minute items, and headed back to Kerry Airport and eventually to home. Thus concluding another trip and another dream destination crossed off our Bucket List.